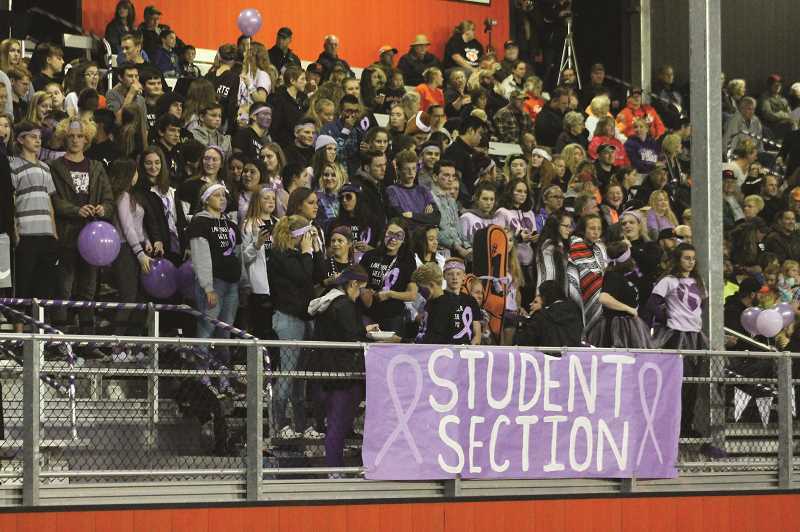 Molalla High School students are once again holding Lavender Week to raise funds and awareness for all cancers. Lavender Week happens Sept. 17-21 with various color-themed dress-up days throughout the week, culminating in Lavender Day at the football game Friday. Students and community members are encouraged to wear the following colors to school and to sporting events. Monday is yellow for bone cancer awareness. The boys' soccer team and the volleyball team both have games at 6 p.m.
Tuesday is dark blue for colon cancer awareness. Wednesday is white for lung cancer awareness. The girls play soccer at 6 p.m.
Thursday is grey for brain cancer awareness. Friday is lavender for all cancers. The football game versus Valley Catholic happens at 7 p.m. This year, students hope to see not only their peers decked out in these colors, but members of the community too. "For all the sports games happening that week it would be awesome if adults going also dressed up," said MHS student Emilie Mendoza, who is heading up Lavender Week. Mendoza opted to donate funds raised from the event to the Children's Cancer Association. "Their Mission is to give joy and spread happiness to kids, teens and adults as much as possible by having programs that 'leverage music, nature, friendship and resources to create transformative moments of joy,' " Mendoza said. To support this cause, students will be selling lavender shirts throughout the week for $13. Any remaining shirts will be for sale at the football game. There are no promised prizes, but certainly bragging rights goes to the person drenched most heavily in lavender Friday.